This simple salad topped with succulent salmon and an aromatic, nutty dressing makes a deliciously healthy Bank Holiday lunch. And you can have it on the table within 15 minutes. If you’ve read my previous blogs, you’ll know that I’m a big fan of salmon. It’s so versatile; you can use it in a range of dishes and it’s used widely across different cuisines, it’s not too pricey to buy, easy to cook, good for you and really tasty. The base of this salad is a simple mix of my favourite salad leaves: spinach, rocket and watercress. The spinach and watercress ground the dish with subtle, earthy flavours and the rocket adds a peppery taste and jagged texture. The dressing is based on a satay sauce I use for pad thai, but using almonds instead of peanuts. The almondy taste is a bit sweeter than peanut and more subtle. Combined with Asian flavours of soy sauce, ginger, chilli and honey, it adds a spicy kick to the salad and brings it to life. 1. Put the grill on to a medium to high heat. Place the salmon fillet on a rectangle of foil and fold up the edges. Spray a few squirts of cooking spray on the fillet and pop it under the grill for 12-14 minutes, checking it half way through cooking. 2. Meanwhile, put all of the dressing ingredients into a bowl with high edges. Use a hand blender to crunch up the almonds and mix the ingredients together. If you have a food processor, you may wish to opt to use that instead as the almonds can be a little tough to crush, but if like me, you’ve only got a hand blender, then persevere with it and you’ll get there with them! When the almonds are crushed, mix them in with the other dressing ingredients with a metal spoon. 3. Put a small saucepan on a low to medium heat. Pour in the olive oil and add the dressing to it. Cook for five minutes, stirring occasionally. 4. Rinse the salad leaves and scatter them across a large pasta bowl or a plate. 5. 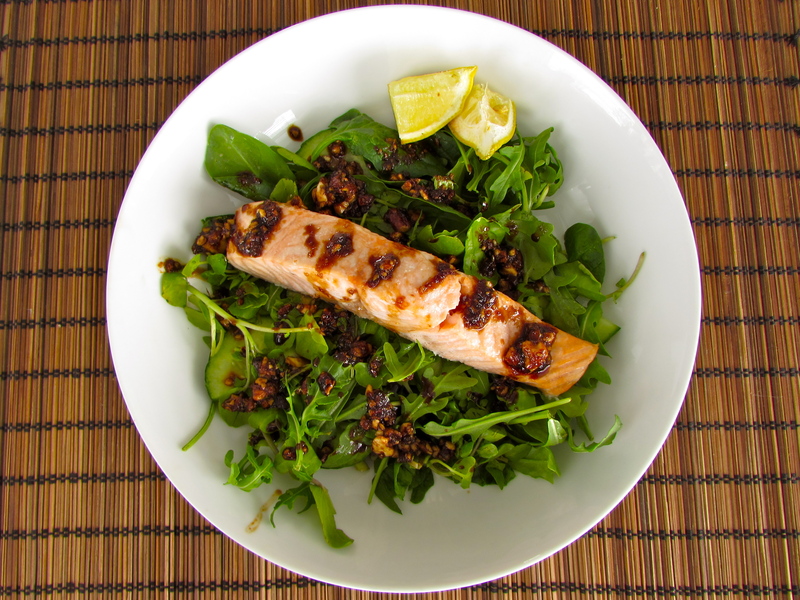 When the salmon is ready, lay it on top of the salad. Drizzle the dressing over the fish and the salad leaves. Cut the lemon quarter in half and pop that on the side as a garnish.